Trigger points (or Myofascial Trigger Points) are one of the most painful and lingering conditions resulting from Myofascial Pain Syndrome (MPS). Myofascial pain syndrome refers to a focal hyper-irritability of muscle tissue that typically presents with a variety of clinical features including referred pain, decreased joint range of motion, and trigger points (the subject of this article). 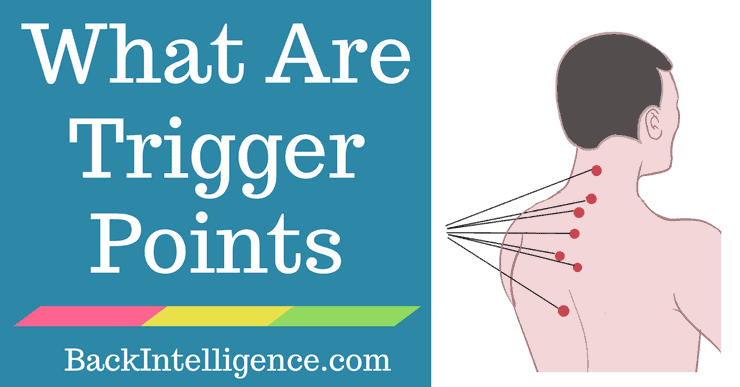 You might be asking yourself, what are trigger points? Well, if you’ve ever had a “knot”, you’ve likely had a trigger point. What Are Myofascial Trigger Points? Trigger points are defined as exquisitely tender spots that can be felt in discrete taut bands of hardened muscle tissue that produce localized and/or referred pain, that are associated with a twitch response. 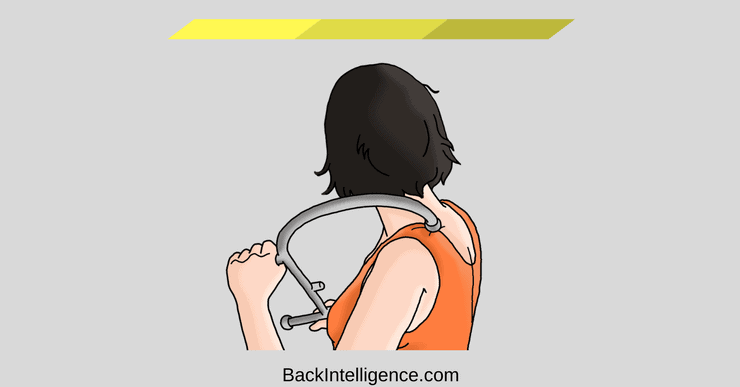 In simpler terms, a trigger point is basically a small muscle knot. If you try to feel the trigger point, it can feel like a little pea under your finger, that is located deep in the muscle belly. You’ll also likely feel a tight band of tissue surrounding the trigger point. If your sense of touch is good, you may also feel the twitch response when you press on the trigger point. Trigger points are classified as either latent or active, depending on their clinical characteristics. What do trigger points feel like? Individuals that have trigger points typically report persistent localized pain that is often associated with a decreased range of motion in the affected area. 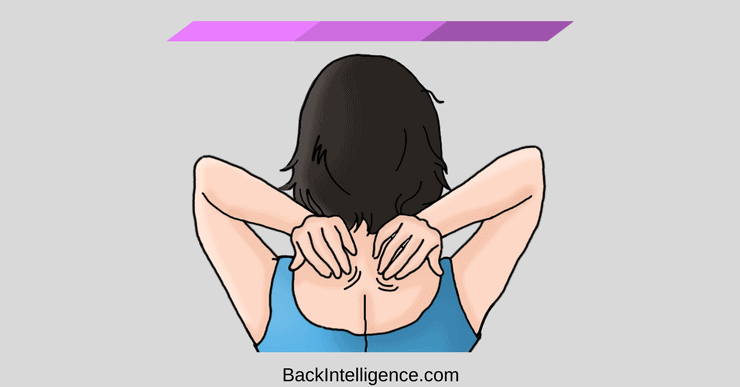 Although trigger points can occur anywhere in the body, muscles involved in maintaining body posture are most often affected, particularly the muscles of the neck, upper back, shoulders, and pelvic girdle. Pain between shoulder blades that feels like lingering stabbing. Pain can be felt at any moment – without any movement. Aside from the pain that is experienced with trigger points, you may also have numbness, tingling, weakness, and a reduced range of motion. In cases of chronic pain, caused by trigger points, you may also experience depression. Knowing the potential underlying cause of your trigger points is important to prevent their development and recurrence and also to eliminate existing trigger points. 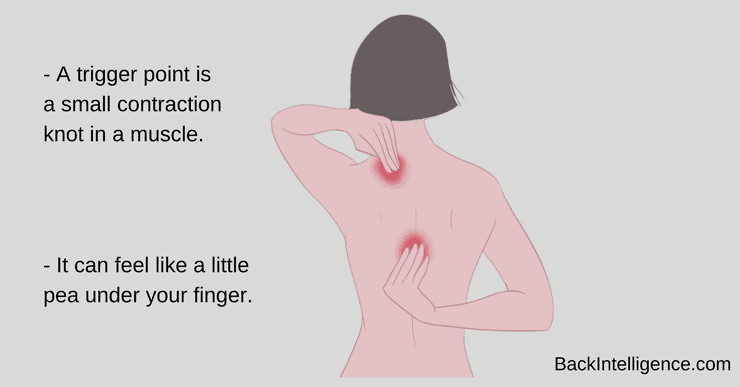 If you’re looking for relief of trigger points, you may want to try these self-treatments that you can do from the comfort of your own home. Why this technique – This handy massage tool can help to reach areas that are next to impossible to reach with other tools. Pressure applied to the muscles using the Theracane helps to maximize the flow of oxygenated blood to the muscles, which helps to restore normal muscle functioning by breaking up adhesions in the muscle fibers and tendons, thereby helping to reduce pain. Use it on your shoulders, neck, chest, back and more. Why this technique – It’s a safe and relatively easy exercise that puts pressure on the trigger point, helping it to release. Contrary to what you might think, it’s the pressure that is applied, and not the rolling, that helps to release pesky trigger points. **make sure you’re only applying pressure to muscles, avoid applying pressure to bones and joints. Why this technique – The goal of a massage ball is to apply pressure to a trigger point by essentially trapping it between your body and something else, such as the wall or floor. The point of using the ball is to reach spots that you’re unable to get to with your hands, or with other tools and is most useful on trigger points in the back and hips. Why this technique – It’s a safe and easy maneuver for trigger points that you’re able to reach and can be done anywhere without any equipment. 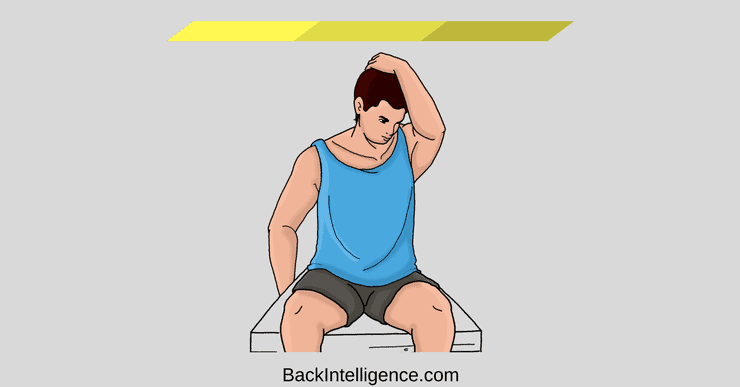 Why this technique – Stretching, especially after doing some self release technique (above) will also lengthen the contracted knot and therefore release it. The key is knowing how to stretch the specific muscles in the right way. How to do it – Find the muscle that has trigger points and figure out the best way to stretch that muscle. Most of the time it’s better to do static stretching where you would hold the stretch for at least 30 seconds at a time. If you suffer from trigger points, you’re likely fed up with the nagging pain that they can cause. The good news is that there’s no need to panic, using the self-treatments discussed above can help to release trigger points and get your pain under control.